The Fruit Pixie has been in existence in various forms since 1993, selling at craft fairs; goods ranging from handmade jewellery to handmade cards. I started dipping into my huge collection of ephemera and vintage items for my card designs in 1995 and there was a huge clamouring from fellow card makers for similar items and ephemera packs priced at £1 started appearing on the stall. Following my marriage in 2001 a huge overhaul took place and The Fruit Pixie in its present guise was born, no longer selling handmade items but still keeping the popular vintage ephemera items and adding anything that fit into my favoured altered art/mixed media style and other things that fired my imagination. 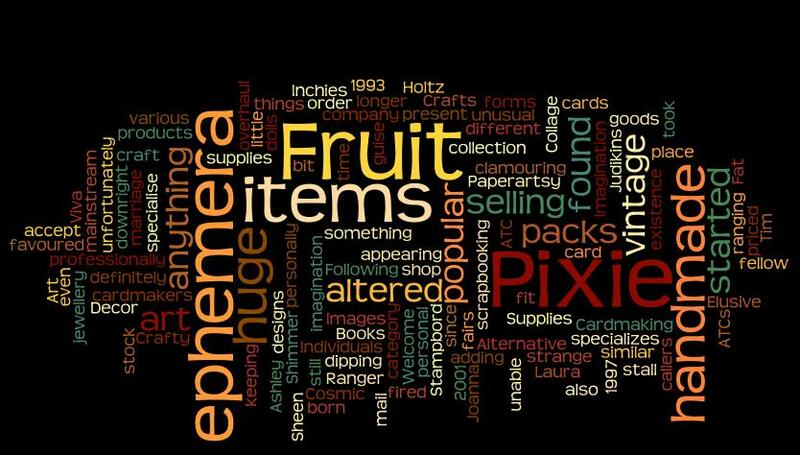 So anything from mainstream to downright strange supplies can be found here at The Fruit Pixie, we definitely specialise in something that little bit different! We are a mail order only company and are unfortunately unable to accept visitors in person at this time.